Sunil Chhetri brushed off a goal-scoring drought and turned up with a brace when it mattered the most as Bengaluru FC came back from a goal down in humid playing conditions to beat Maziya S&RC 1-2 at the National Football Stadium, in Maldives, on Tuesday and book a place in the last-16 of the AFC Cup. Chhetri tucked home a penalty in the 70th minute after Sean Rooney's cross caught a sliding Saaif's arm in the box, and followed it up with a peach of a finish eight minutes later when Udanta Singh picked him out with a delightful lob for a pass as the Blues were rewarded for an impressive show for most parts of the game. The win, Bengaluru’s third on the bounce away from home in all competitions, keeps the Blues on second place with 12 points and one behind leaders Persipura Jayapura who travel to Bengaluru to play a game which will decide who finishes Group E as leaders. A 4 pm kick-off in humid Male meant battling more than just group contenders as Ashley Westwood took advantage of his impressive depth in squad to hand Thoi Singh, Siam Hanghal, Udanta and Keegan Pereira starts. Even Chhetri and Robin Singh, who came off the bench in the 2-0 win over Bharat FC last week, made the first XI. 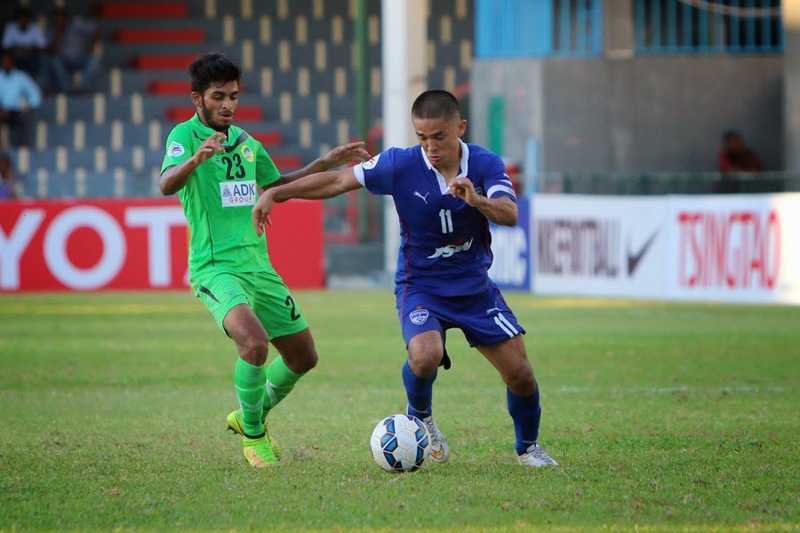 But Bengaluru didn’t let conditions alter their usual attacking style of play, taking the game to Maziya early on. Playing down the right, it didn’t take long for Udanta to advertise his blistering pace that gave Maziya defender Samdhooh a harrowing time. From one of the many attacks from the right on the afternoon, Robin hit the post from a Rino Anto cross. And just as the half was drawing to an end, Maziya ’keeper Imran pulled off two saves from shots by Hanghal and Chhetri. However for all the chances Bengaluru had, it was Maziya who shot into a lead on the hour mark after Samdhooh’s cross from the left was tapped home by Pablo Rodriguez.Refusing to let the setback deflate them, Bengaluru began building up play as Westwood threw in Sean Rooney and Eugeneson Lyngdoh for Hanghal and Thoi in the 65th minute. While Rooney’s cross earned Bengaluru the penalty that led to the equaliser, the winner was a delightful team goal. Picked out by Rooney and on the edge of the box, Udanta lobbed the travelling ball first-time after spotting Chhetri’s run in the box. The skipper volleyed home a perfect finish, capping off an important win. Maziya could have got an equaliser of their own but Rodriguez’s header came off the bar five minutes from time. Lyngdoh then came close to getting Bengaluru’s third two minutes from time but his shot was kept out by Imran.